I’m excited to bring you another client success story today! 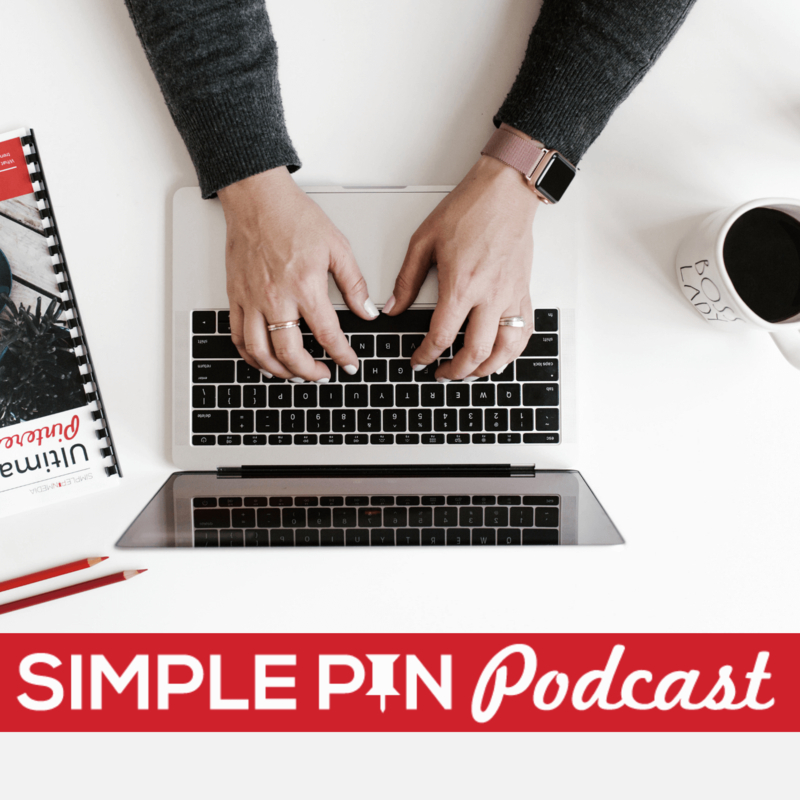 I’m sharing how one client has been gaining exposure on Pinterest and rocking her food blog as a consequence. Today’s podcast episode is sponsored by our standard maintenance package. You can go to our Services page and find out more about our management packages. We have three different levels of Pinterest management. Today we’re going to be sharing more about that standard maintenance package and how we use it to help one of our clients. I’m excited to have Lindsay of Cotter Crunch on the podcast with me. We’re going to be talking about her 2-year history with Simple Pin and what growth and opportunities she has experienced during that time frame. Lindsay is a nutrition specialist and her husband was a professional triathlete for 10 years. Her husband was the first to create a blog. On that blog, he would post about his training and Lindsay would occasionally post recipes. Eventually, her husband suggested that she start her own blog…so she did. Lindsay initially blogged about sports nutrition and her husband’s training regimen for racing. During that time, Lindsay also had some health issues due to a parasite she contracted in Africa while working in an orphanage. Her health issues, combined with her husband’s training regimen, led her down the path of becoming a gluten-free nutrition specialist with a focus on sports. She’s always had a desire to help people heal from food allergies and educate on the topic of sports nutrition. Her husband retired in 2015 due to an injury. At that time, Lindsay decided to rebrand and shift the focus of her blog. She started honing in on gluten-free food using a holistic approach, and really started to focus on her food photography. Helping people live a gluten-free lifestyle is now her passion. Lindsay first started using Pinterest in 2010, back when you had to be invited to use the platform. She doesn’t even remember what she was pinning back then. It was a totally different layout than it is today. She became more active on Pinterest in 2014 when she was busy creating recipes for various companies. Before that, all she had pinned was workout ideas. In 2015, she started to use Pinterest to promote her own brand and started working on improving the quality of her photography and pins. Lindsay came to us in February of 2016 as our 49th client. She learned about us through my appearance on the Food Blogger Pro podcast. She initially hired us for a consultation. After learning about our management services, she decided to make the investment in our standard Pinterest management service to take that task off her plate. When she first started working with us, she was getting 26,000 page views from Pinterest. In May of that year, she jumped to 103,000. In July of 2017, she hit 292,000 page views. Her Pinterest traffic has grown steadily since that time. Through that growth, something really amazing happened. Lindsay was offered a cookbook deal. She was approached because of her pins on Pinterest. Having her own cookbook was a childhood dream so it was super exciting when this opportunity presented itself. Her cookbook, Nourishing Superfood Bowls launched in March of 2018. Creating the cookbook really helped to cement her brand. Lindsay looked at what content of hers that people were pinning in order to decide how to photograph for her cookbook. She really focused on the food contained withiin the bowl and not what was surrounding it. Sometimes, you feel pressure to photograph your food the way that everyone else does (like incorporating a lot of props). Lindsay was supposed attend a photography workshop in California but she couldn’t make it. She asked her blogging friend Taylor (Food Faith Fitness) to send her notes on the material that was presented during the workshop. She then attempted to copy the suggested photography style, which included a lot of plating and pairing items together. Lindsay became frustrated because she didn’t feel like she was good at setting up these photographs. Later, she attended a styling and branding workshop by Lindsay Ostrom. They were given a list of words to describe their brand and were told to really focus on those words. At that workshop, Lindsay decided to just focus on doing what she knew she was good at. That freed her up to be more creative. She no longer succumbed to the pressure to follow the current foood photography trends. She started fine-tuning what she was already good at. This post contains affiliate links, which means if you make a purchase through these links, I may receive a small commission at no extra cost to you. Cli read my full disclosure policy. There are pros and cons to outsourcing any type of work. When she started with us at Simple Pin, one of the toughest parts for Lindsay was letting go of the control she had over everything. However, letting go of that control turned out to be advantageous for her business. It really gave her the ability to focus on what she was good at. She didn’t have to think about the changing Pinterest algorithms. Instead, she could just focus on the tasks in her business that she enjoyed and excelled in. Lindsay’s account specialist Annie says that Lindsay produces great seasonal recipes, as well as variations of her older posts. Her anti-inflammatory meal plan has almost consistently been her number one pin. Because of this, she has created a lot of other meal plans and has a entire board dedicated to them. She monitors food trends. In spite of being in a really heavily saturated niche, she stays ahead of trends and produces content to fit that niche. Lindsay is able to take things she was passionate about back in 2009 and use them to educate people. It just so happens that some of it is now on trend! Because her anti-inflammatory meal plan was so popular, Lindsay has actually created an Anti-Inflammatory Meal Plan Bundle. It includes educational videos about nutrition and a ton of recipes. Think about the traffic that you’re getting year after year. Is there that one pin that stays on top? Instead of wishing your #1 traffic driver was a different pin, think hard about how you can take advantage of the traffic you are getting to THIS pin to monetize it. The greatest benefit of outsourcing for Lindsay is having someone else looking into your business and providing feedback. Everyone has control issues. In order to grow, it’s important to cultivate the ability to “let go” and listen other’s valuable perspectives on your business. Lindsay would never have created so many meal plans if Annie hadn’t pointed out that her meal plans were wildly popular on Pinterest. In the future, Lindsay wants to create more meal plan bundles and maybe even create another cookbook. Her goal is to keep feeding her audience, literally and figuratively! Another goal that Lindsay has is to support fellow food bloggers. And that’s what her latest project — the Foodie Bootcamp — is all about. It’s a workshop focused on helping food bloggers batch a whole lotta content creation into a few short days. If you’re a foodie blogger, you definitely don’t want to miss this unique event!